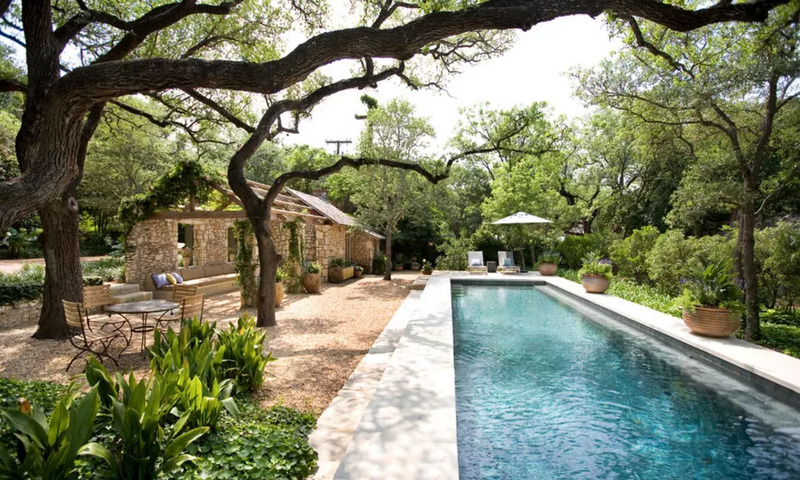 A modern backyard by Murray Legge Architecture of Austin, Texas includes a pool house with a roof featuring grasses, sedges, and wildflowers native to Central Texas. 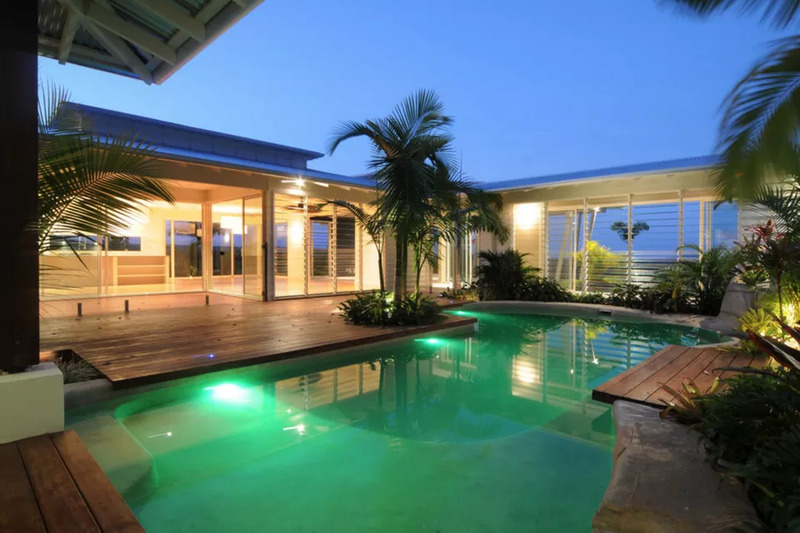 Mortarless cut Leuders limestone on steel was used for the pool decking, while Bisazza mosaic glass tile covers the pool interior. 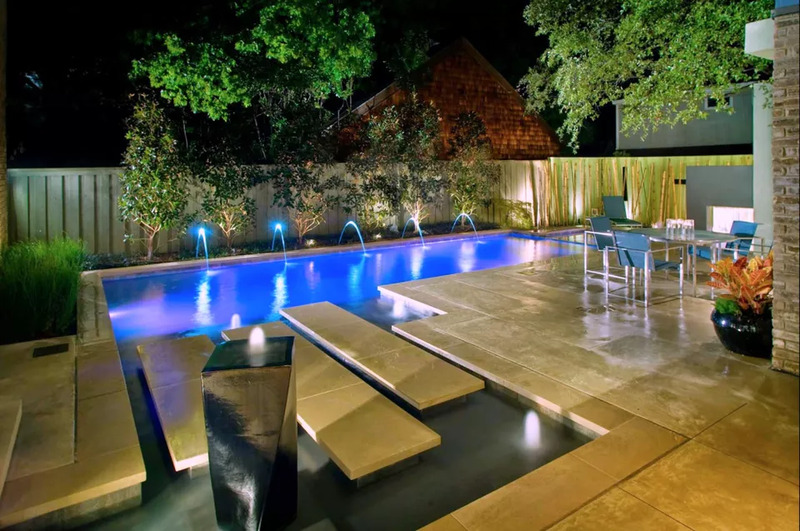 Stools inside the pool were formed with tubes and gunite. 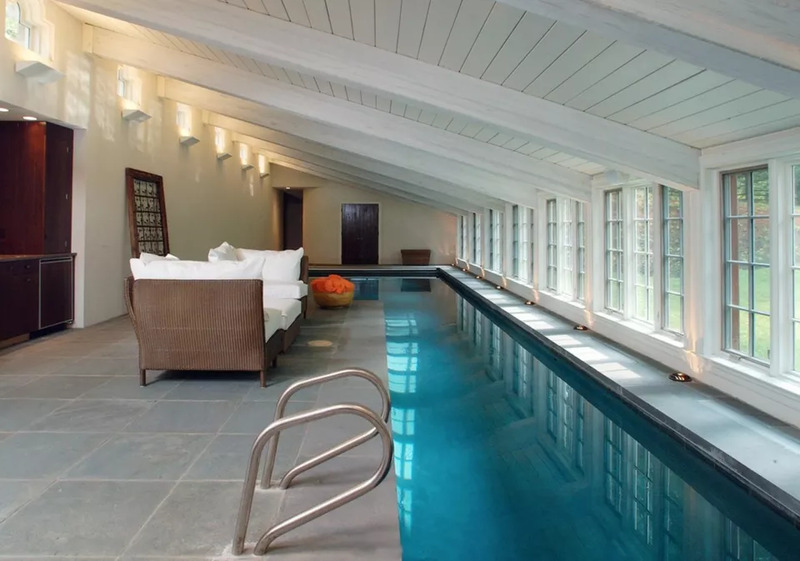 A lap pool at a private residence in Greenwich, New York overlooks a river. 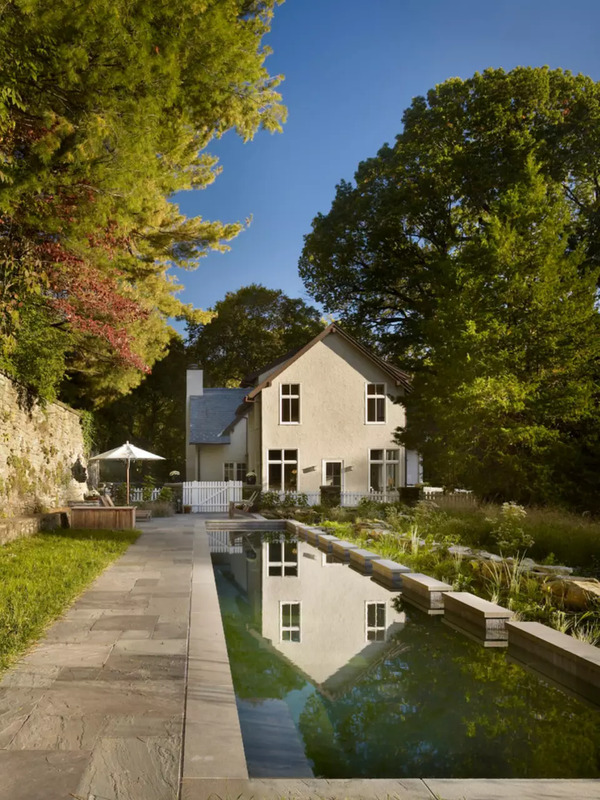 Designed by Austin Patterson Disston Architects, the long pool was built to take in the view and is surrounded by Connecticut stone. 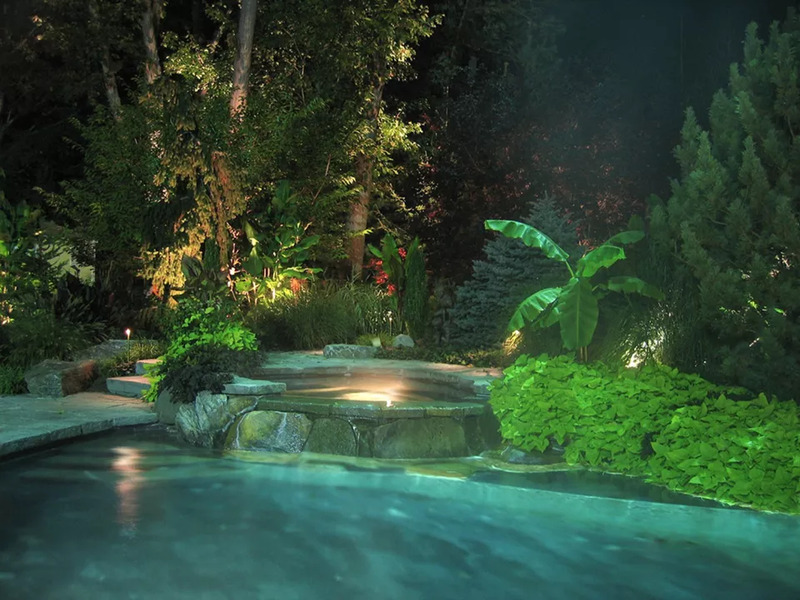 Patdo Light Studio of Port Chester, New York illuminated a backyard swimming pool to accentuate tropical features of the outdoor pool, including landscaping, waterfalls, and hardscape. 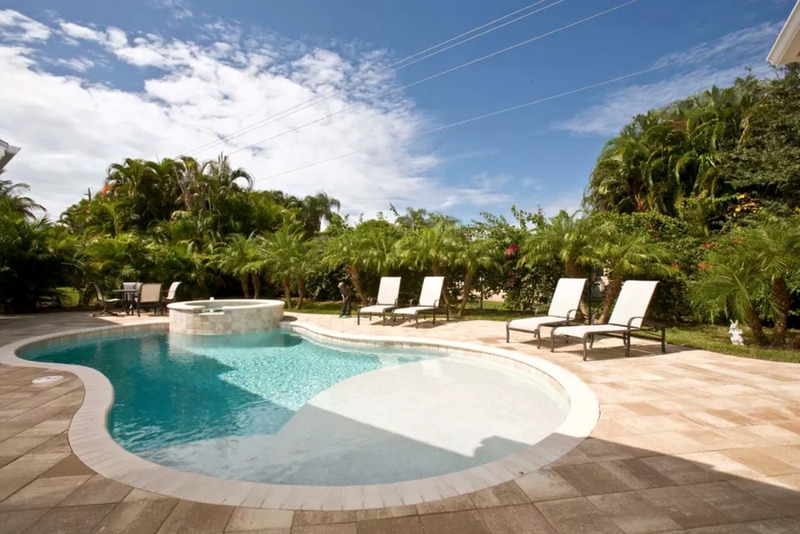 At a Naples, Florida house, 41 West created a pool with a natural pebble finish to accentuate the clear water reflecting the sky, especially when it’s pure blue. 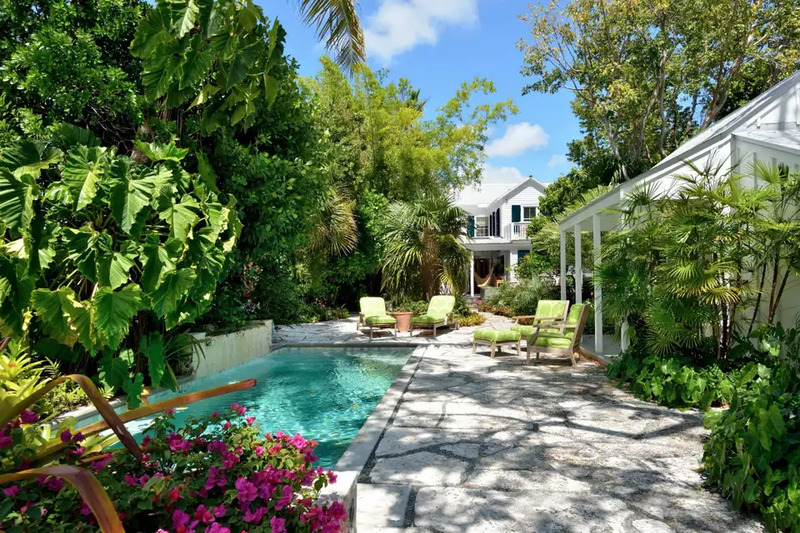 With the hot Florida sun in mind, the decking is made of cement pavers set in sand so bare feet won’t get burned. 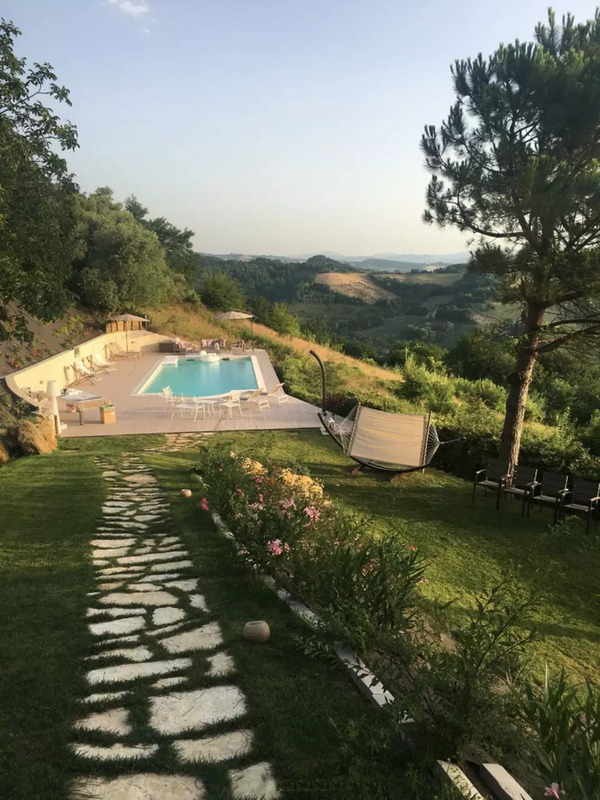 A terraced hill in Bologna, Spain is a private spot for late-afternoon swims with views of the Mediterranean landscape. Designed by Deposito Creativo, Villa Privato Bertinoro features a farmhouse with places to relax and enjoy the scenery when not working. 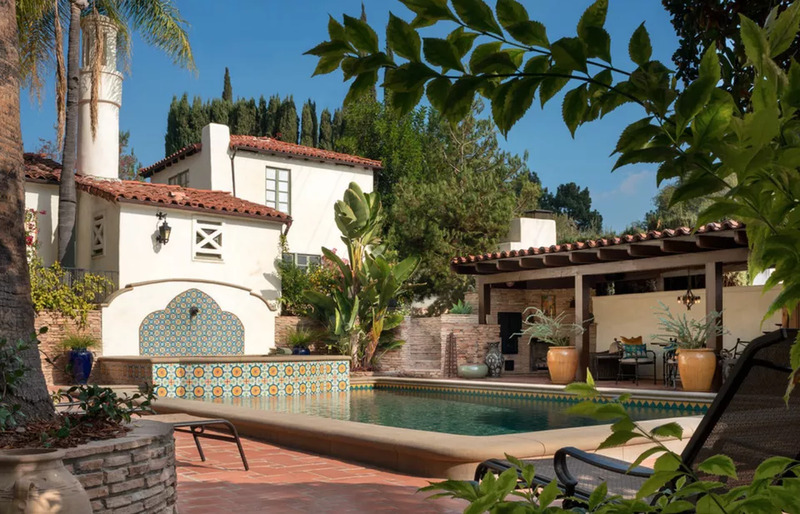 A Spanish Colonial Revival house in Glendale, California was restored and received an outdoor design makeover by Sacred Space Garden Design and Huntington Poolsthat included era-appropriate hardscape, water features, tile, and landscaping. 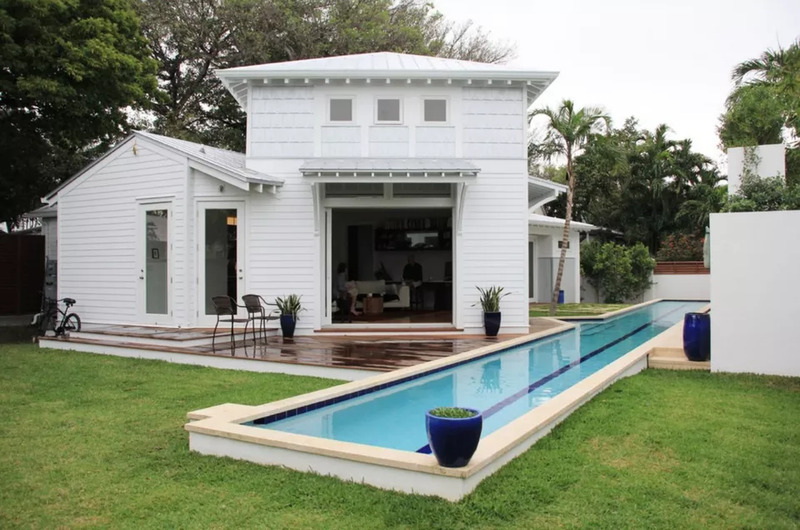 A remodel included a pool cabana that replaced an old enclosed back house and a pool with an architectural fountain feature and oversized plant containers. 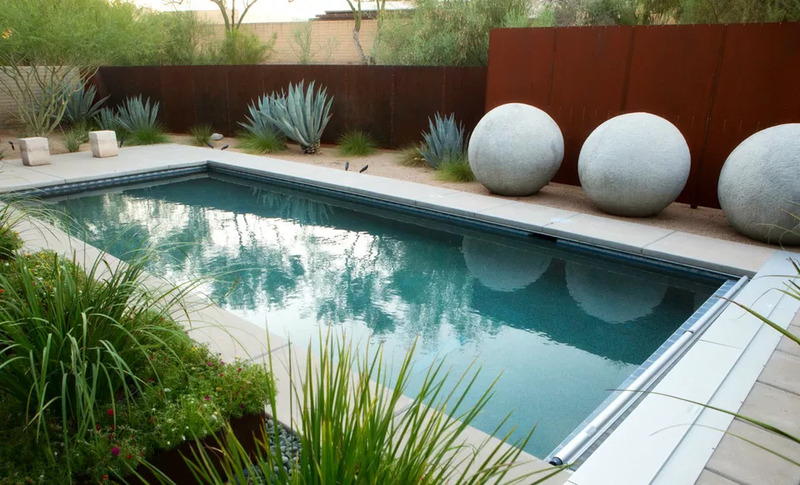 This was a team project that included Key Residential, Pool Environments, Jason Osterberger Designs, and Randy Angell Designs. 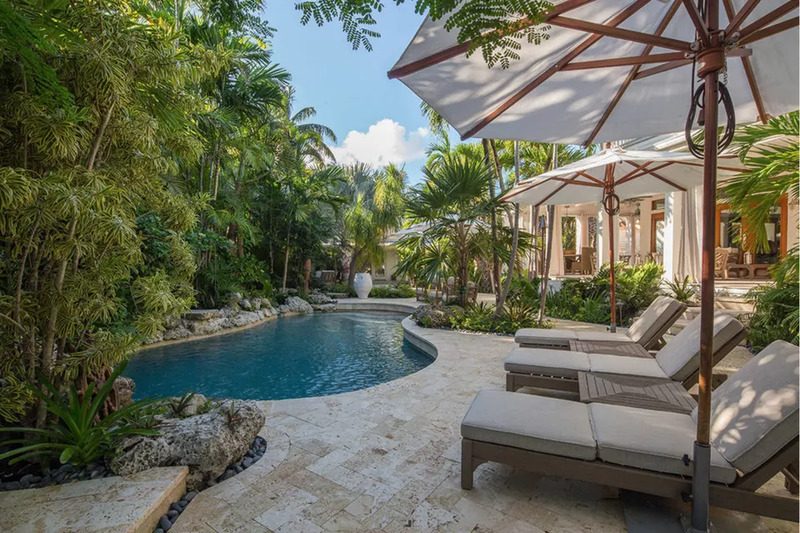 The cabana includes outdoor ceiling fans and heaters, a built-in mosquito spray system, a fully equipped outdoor kitchen with a linear fireplace and hearth that extends to the pool fountain. 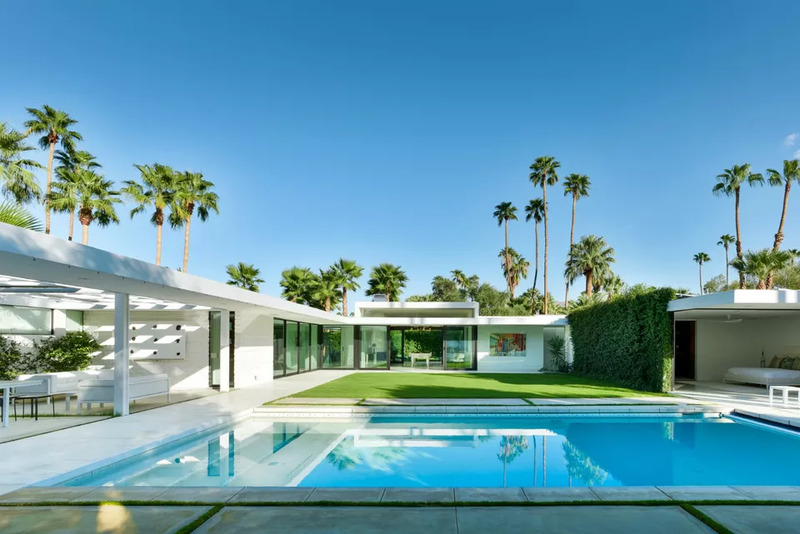 A Midcentury modern Alexander home in Palm Springs designed by Palmer & Krisel retained the original look and vibe but received some contemporary updates, like an integrated spa, ground-level fire pit, and a mosaic outdoor shower. 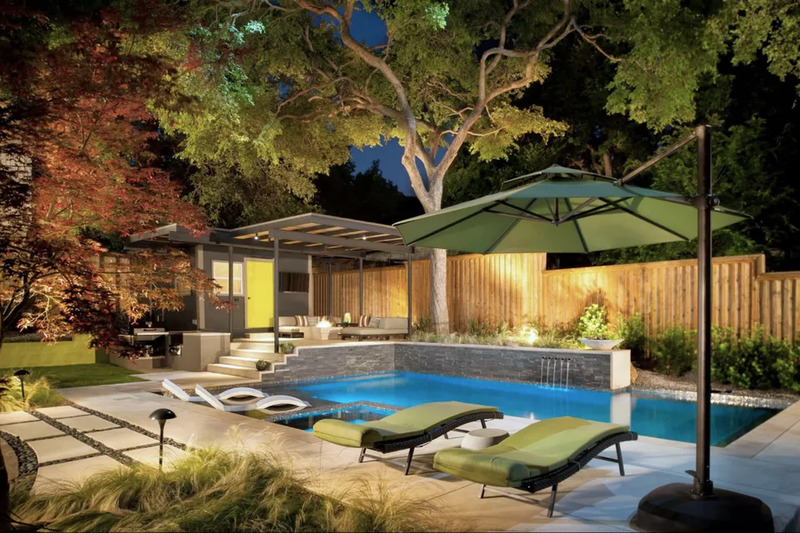 H3Kincorporated clever features like “moats” of grass between concrete slabs and choosing era-appropriate furnishings, like the pagoda California Umbrellas, CB2 chairs, and Surya pillows. 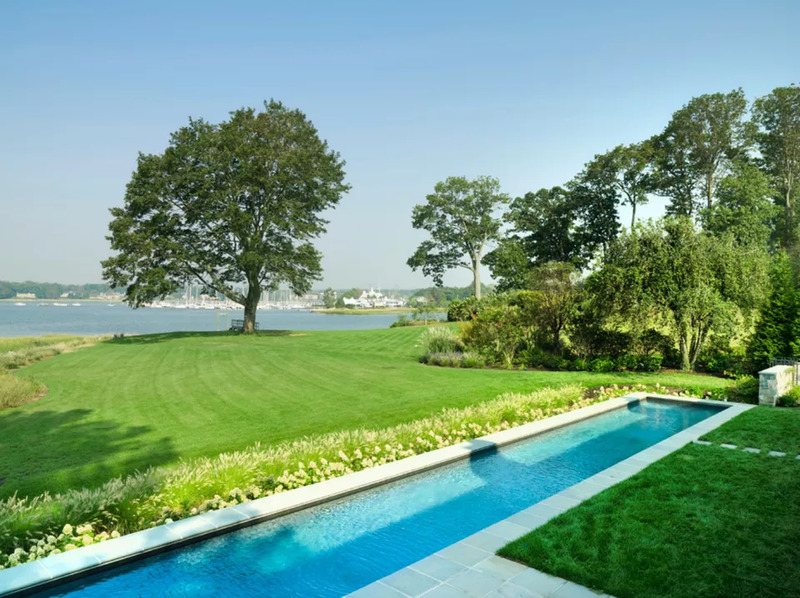 A clean, classic rectangular pool with bullnose bluestone coping and a carpet of green grass that rolls right up to the water’s edge was designed by Thomas Flint Landscape Design & Development for a large property in Ridgewood, New Jersey. 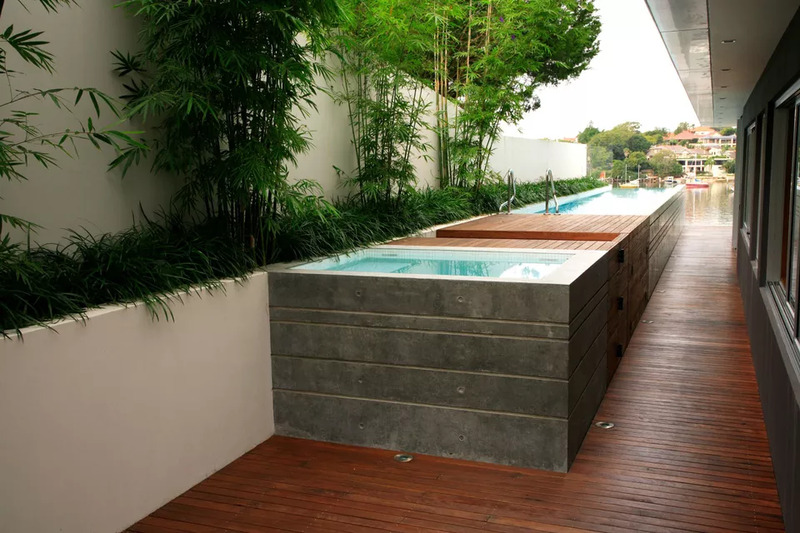 An elevated lap pool by Secret Gardens in Sydney, Australia is built of hardwood and concrete, with Ophiopogon Japonicus running the length of the pool. To anchor those large granite boulders, The Landmark Group built raised pillars and benches while pouring concrete to accommodate the big rocks. 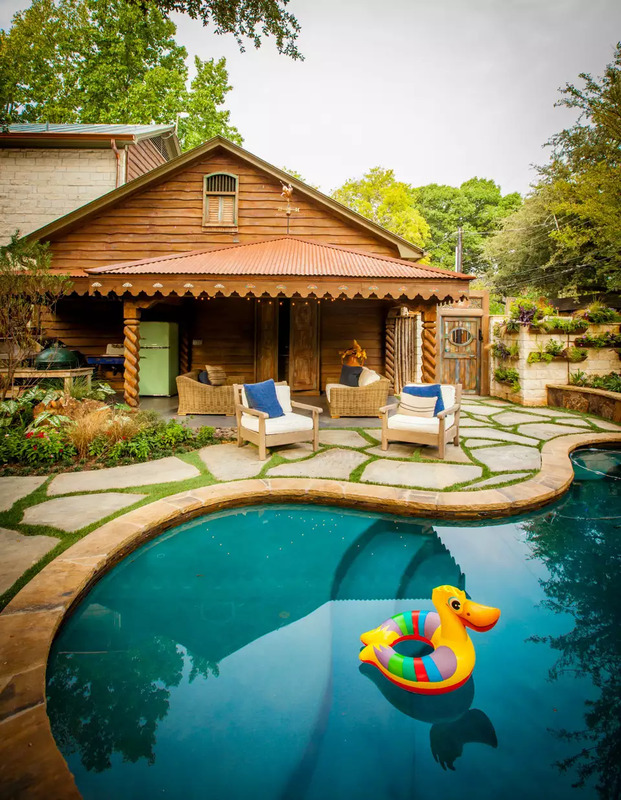 Large pieces of flagstone quarried from local limestone were used for the pool decking, separated by 1-inch polymeric joints. 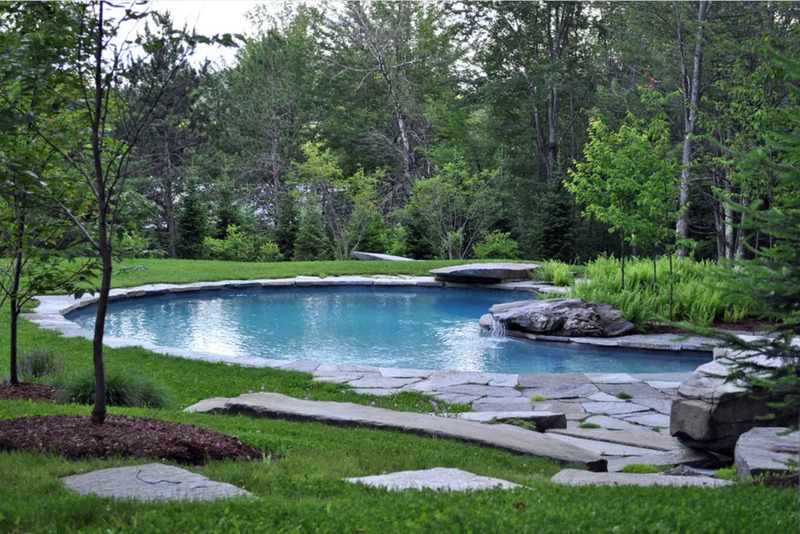 Since the pool is in Toronto, Canada, it’s drained during the winterizing process. 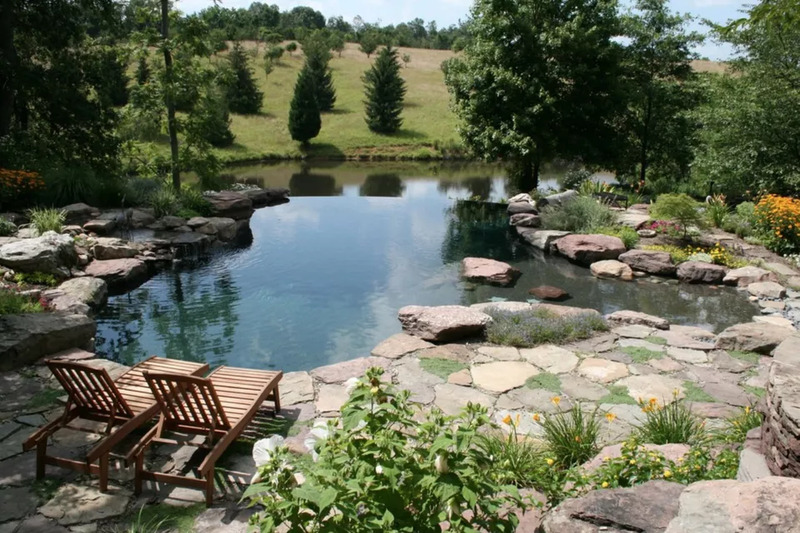 An existing land depression (dip) on a Vermont mountaintop was an ideal spot for Shepard Butler Landscape Architecture to build a pool that becomes part of the land. SBLA used local stone slabs and stacked them on the south end for a raised sunbathing platform. 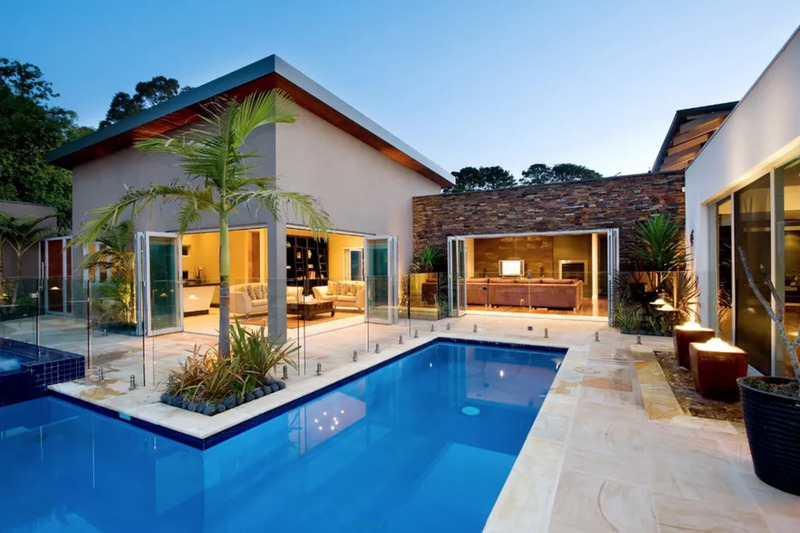 Stone steps lead to a niche with stone benches and an integrated fire pit. 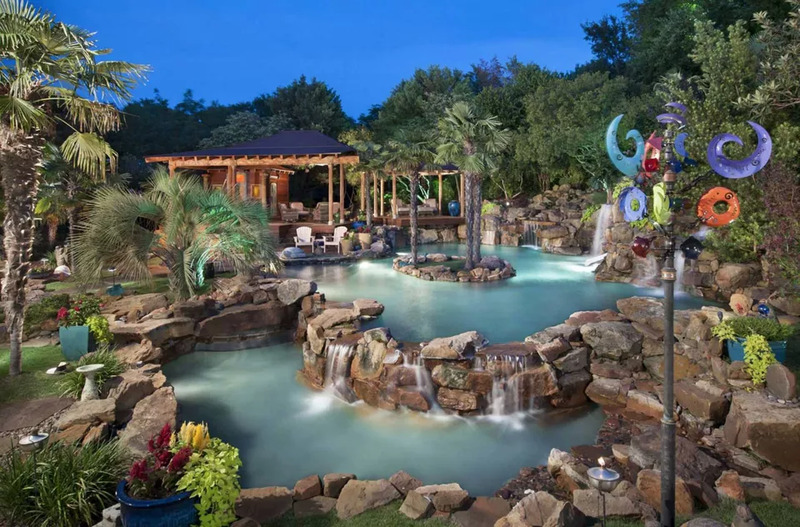 A stone waterfall, sculpture, and dive stone continue the natural look. 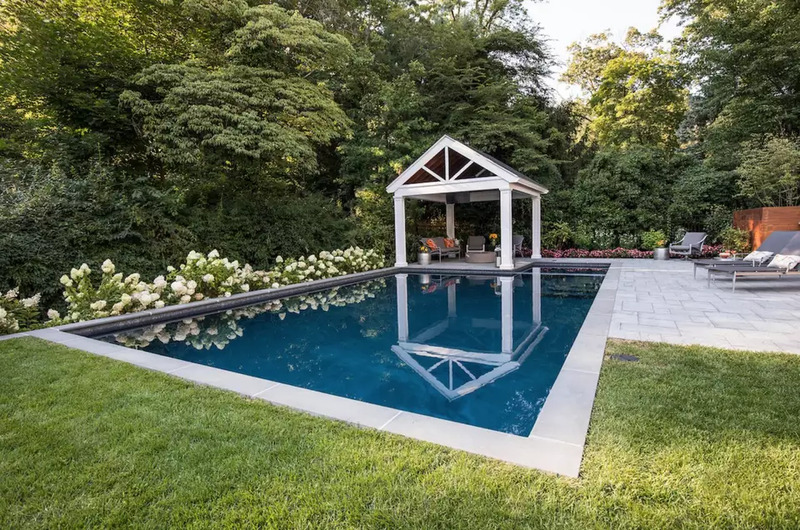 For a backyard pool in the Washington DC metro area, Poole’s Stone and Garden used a pebble pool finish on the surfaces, then integrated stone and natural materials, for a look that blends with the natural surroundings. They say the greenest building is the one already built; the same could be said for existing materials. 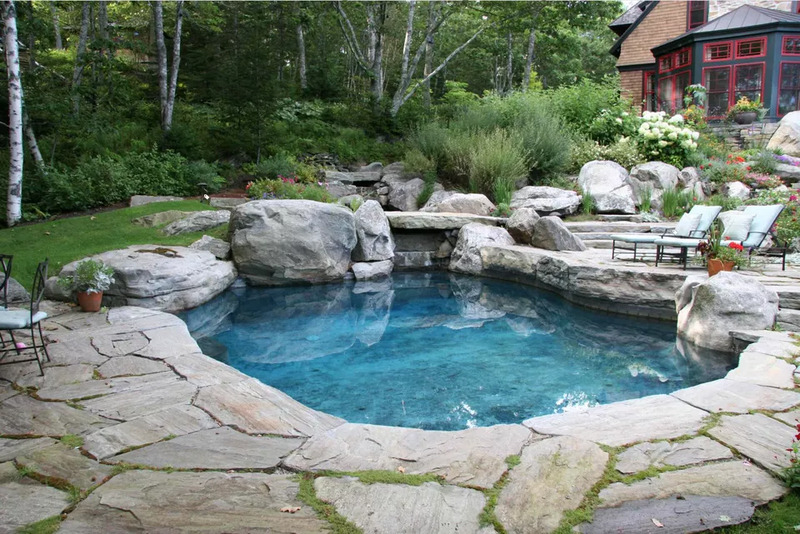 Stone Farm ​in Connecticut uses reclaimed curbing and accent pieces as coping for swimming pools and outdoor features for a unique, one-of-a-kind look and feel. 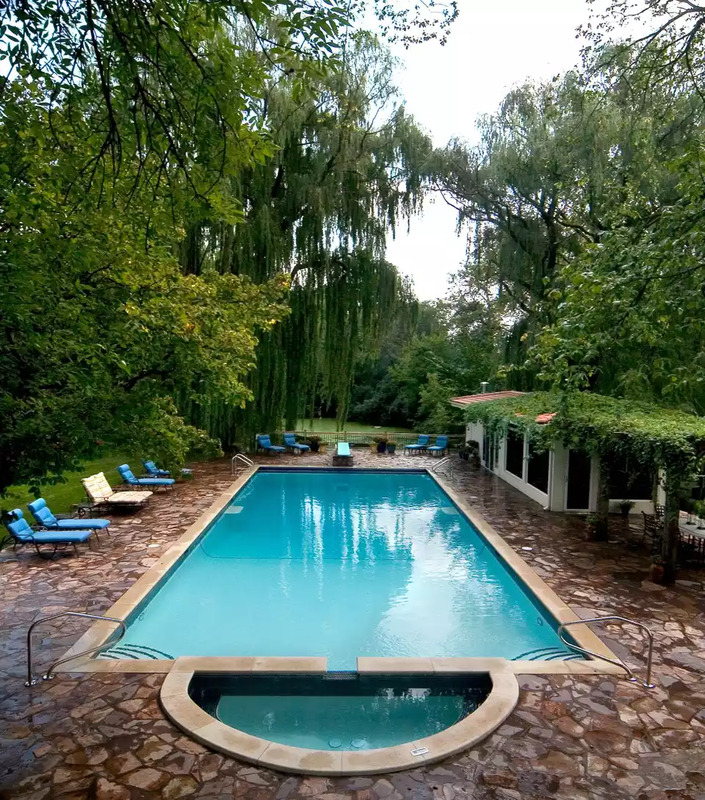 Natural pools have been popular in Europe for several years; this eclectic design by Bau-Fritz GmbH & Co. in Germany includes a pergola with a hanging cocoon-like treehouse chair. 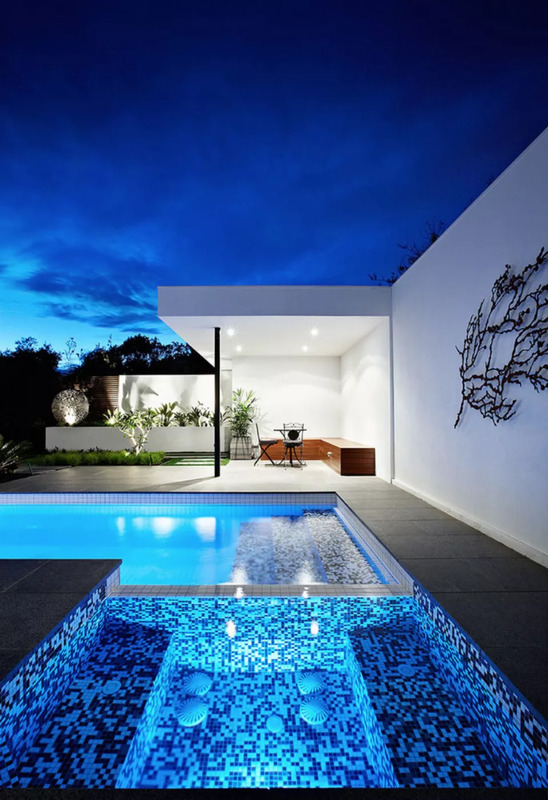 This elegant backyard design actually includes a pool barrier, which is required by law in Victoria, Australia. 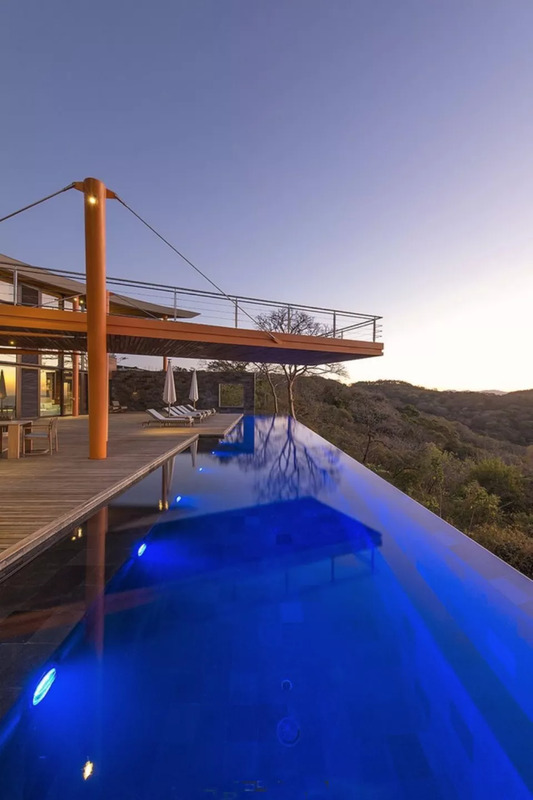 Each glass panel is held in place by a custom-fabricated stainless steel “clamp.” The project, from Design Unity, allows unobstructed views of the pool and yard, and from the pool to the house and surroundings. 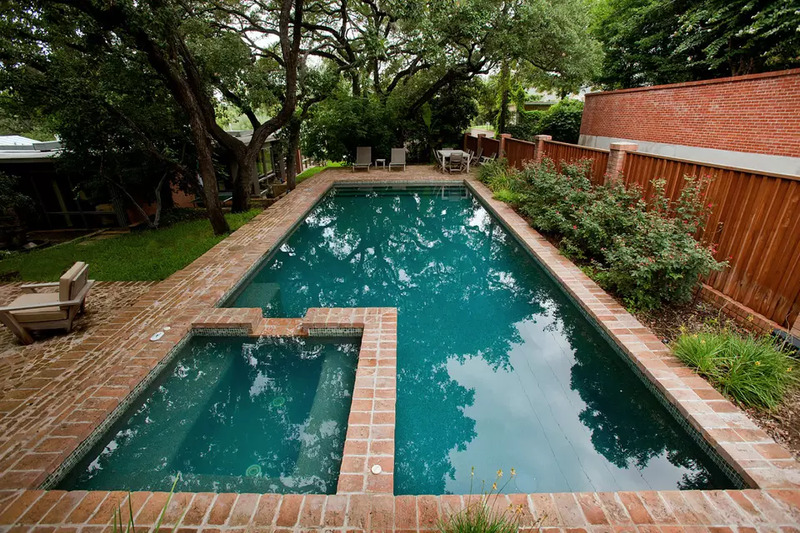 The pool was resurfaced with royal blue Quartzon. 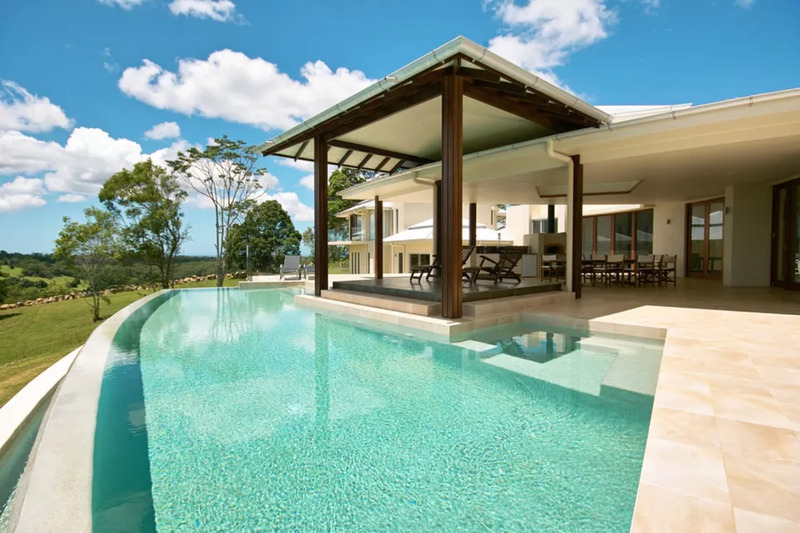 Sealed sandstone pavers for decking are cool to walk on when Noosa temperatures rise. 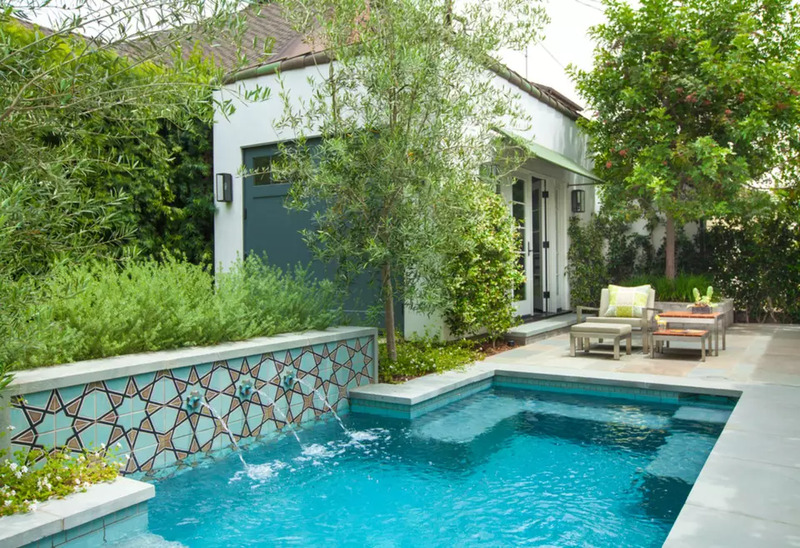 Inspired by early 20th-century Modernist architect Irving Gill, this San Diego pool and landscape designed by Bill Bocken Architecture and Interior Design has Mediterranean features like climbing vines and palm trees. 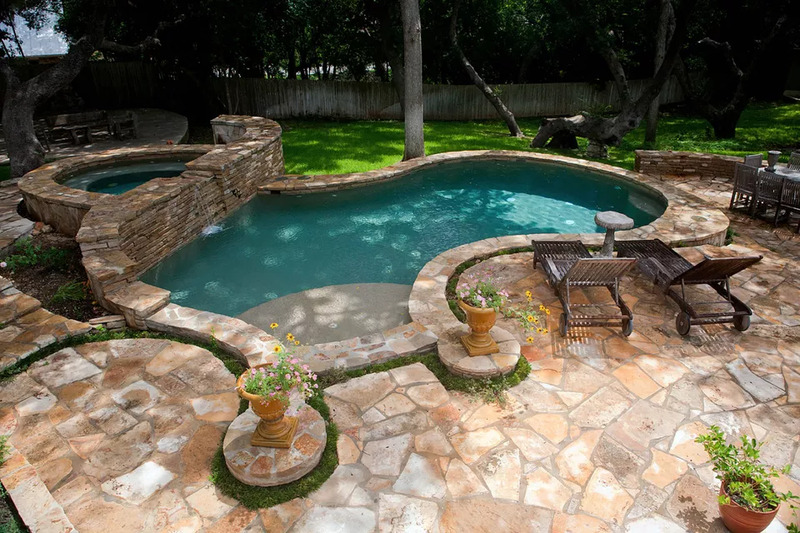 Flagstone that flows from the patio carries out to the pool to form natural coping at the pool edges. 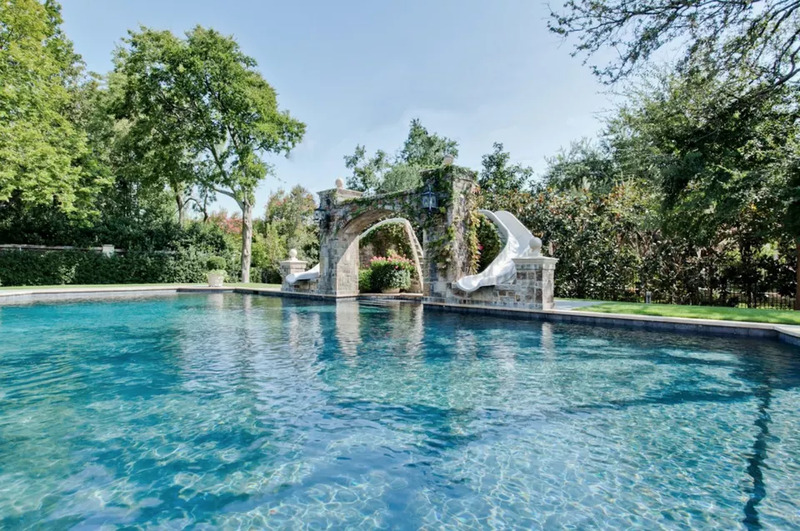 Designed by Brad Sharpe Pools and Shows & Allen Landscape Architects, the San Antonio, Texas yard includes water features and a vine-covered pergola. 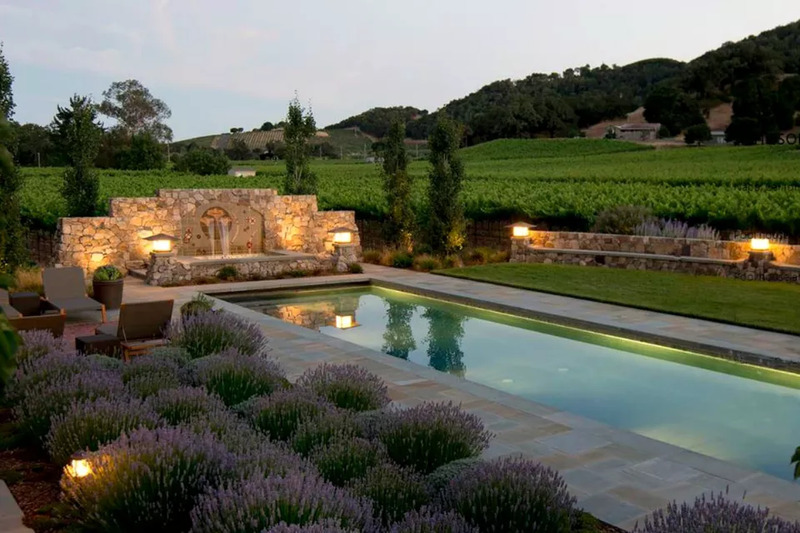 One of the many California dreams: to live in a vineyard. 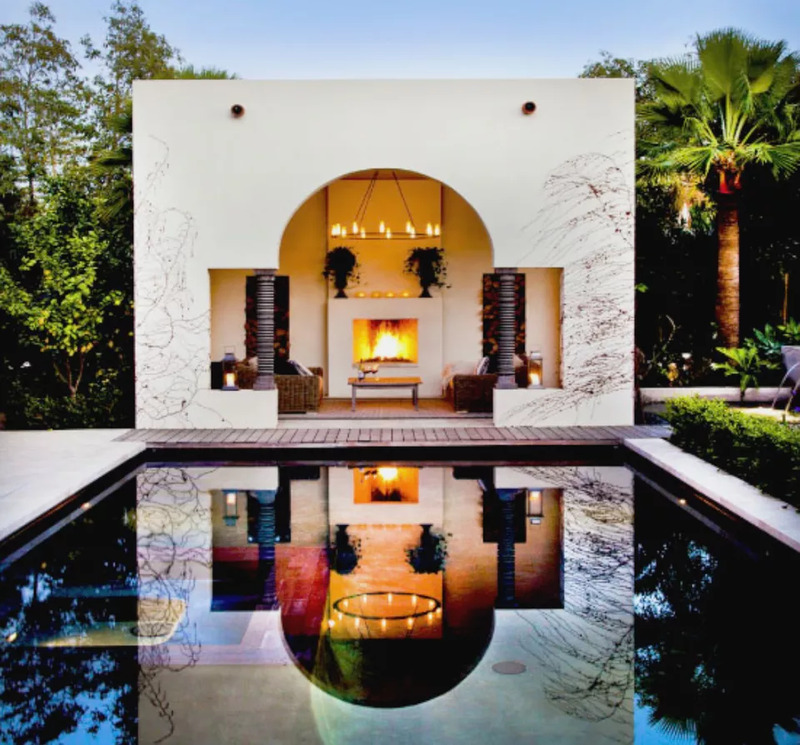 This property near Yountville, California features a Craftsman style house with Mediterranean landscaping by Roche+Roche, with Kennedy & Kennedy Architects, and Le Reveinterior design. 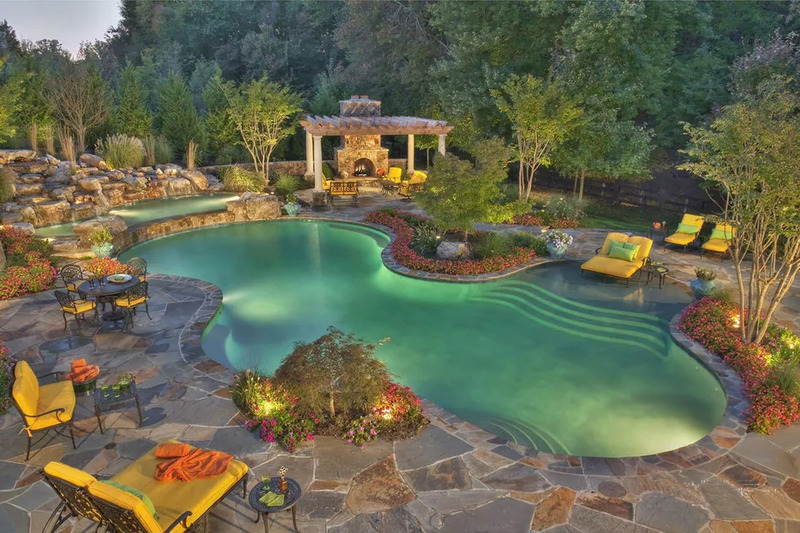 Bluestone pool decking features brick-inset “carpets” and a custom-tiled spa was designed by the owner and Metolius Ridge. 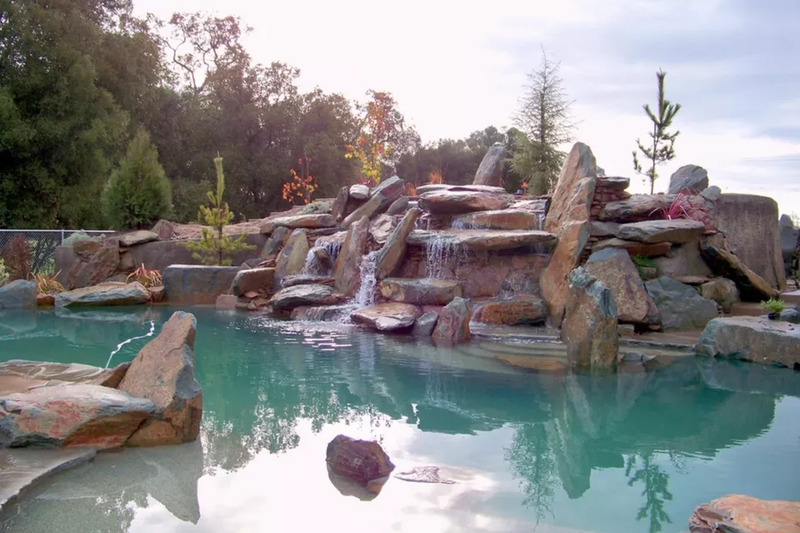 More than 200 tons of boulders were used to create the waterfalls of this natural looking pool in Lodi, California. 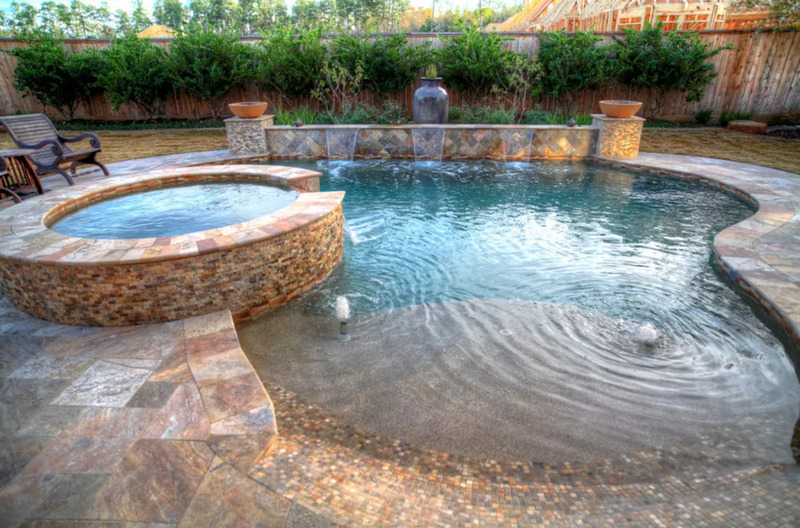 Liquid FX Pools built pathways, caves, and a 30-foot-long tube slide into the stunning water feature. 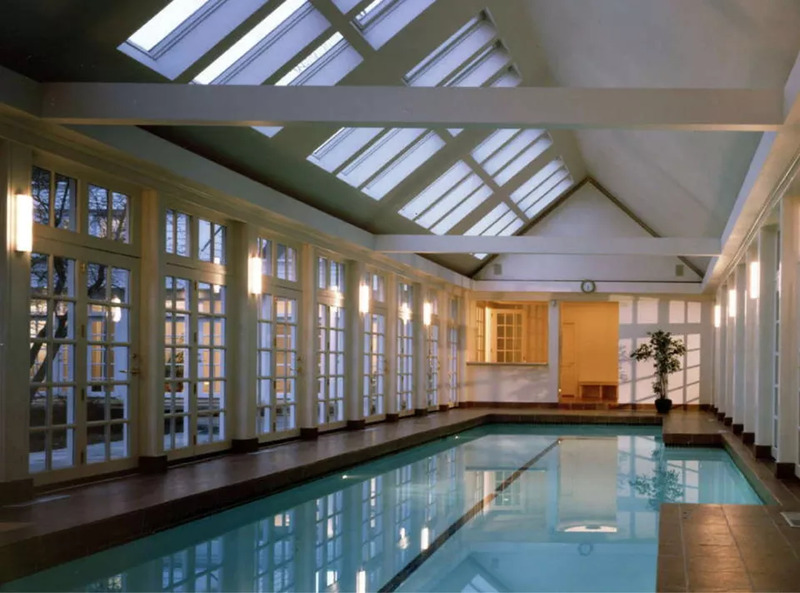 An indoor pool in Short Hills, New Jersey, designed by Katz Novoa Architects, allows light to filter in through overhead and side windows while still keeping swimmers warm and under cover. 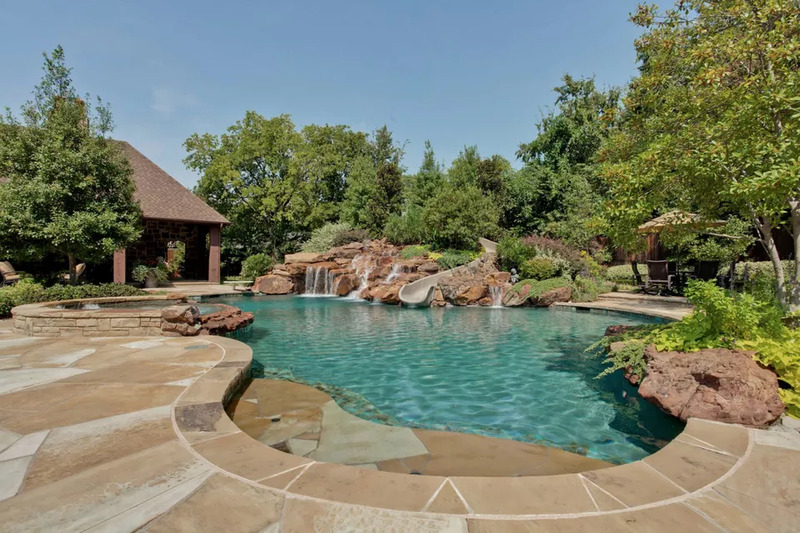 Oklahoma flagstone set in concrete surrounds this family pool by Rosewood Custom Builders that also features Creme de Menthe Pebble Tec finish and a 30-foot slide. 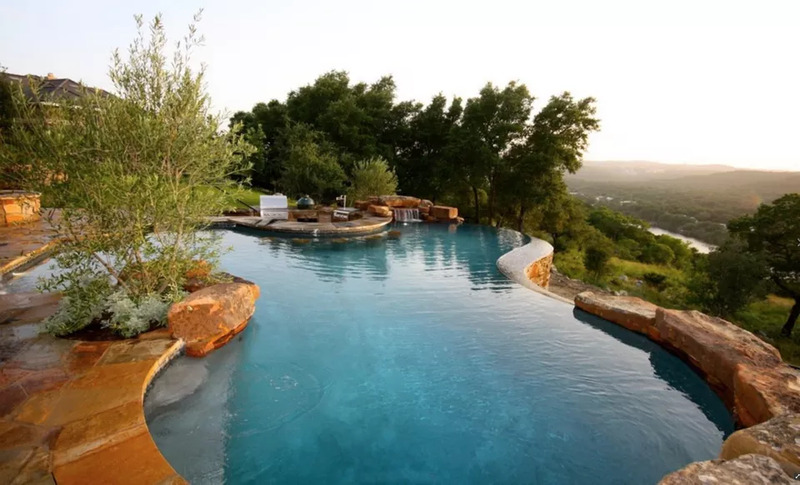 Design Ecology created an infinity pool that looks over Lake Austin features a sunken kitchen at the water level, along with a private spa.